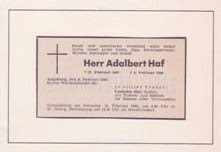 Adalbert Haf ~ My maternal Grandfather. He is buried in Augsburg, Germany. The sad part is that in Germany, grave site space is limited. My Mom explained to me that you basically "rent" grave sites. My Oma, (grandmother in German) paid for his grave site in 20 year increments. She is 95 years old and cannot keep up the grave so she had to let it go! She is in a home there. I was born in Augsburg, Germany and came here when I was 2 1/2. My Opa and I were pretty close and he had a hard time when my Mom and I left. Below is his Obituary...I do not read German (yes sad I know) so I am unable to translate! 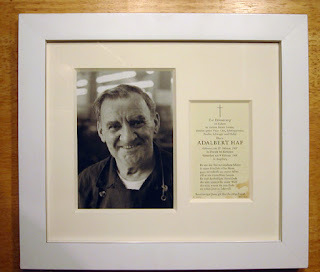 My son-in-law Jonathan matted and framed this photo of my "Opa" Adalbert Haf with his Memorial Card, I love the way it turned out. I have it hanging in my hallway "gallery of family photos". My "Opa" was a Webermeister which is a Fabric Weaver or also known as a Jauuard Designer in Augsburg, Germany, a historic city for weavers. The Company he worked for was 'Buntweberei Reidinger'. I love his smile! Here's to you Opa! So, what happens to his grave now? Can another family member take care of the "rental?" It's a lovely tribute Gini! Gini, Opa is beautiful. You can see the smile lines around his eyes that I like. I'm sure he missed you like crazy. Have you been able to go back to Germany and see his grave? Thanks so much for such a tender memorial. Virginia, thank you, I spoke with my Mom again this afternoon and asked her more details, I also did some research on it, the data says exactly as my Mom had explained it to me. Germany "rents" gravesites for 20 to 30 year periods and you can get extensions (this seems so odd to me!) 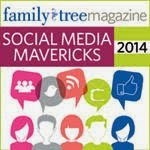 When the mourners have passed or the family is no longer able to keep the gravesite up, no longer have it. I asked my Mom, "Ok, what happens to Opa!!" She said that the body and all return to the earth and another person is buried on top. You can tell by the photo that Germans really take care of gravesites. My Oma planted flowers and maintained Opa's grave. The headstone was made from Marble I think, I will verify that with my Mom, but I asked her, "What happened to his headstone?" she said, well they sand the dates and name down and reuse it. I have to tell you, I am having a hard time with this one! My Oma will be cremated and brought here to San Diego and will be buried at El Camino, she already has a space next to my Mom and her husband. So I will see her again and she will be close to me at that point. Those are her wishes, there really isn't anyone left there to care for her grave so she wants to be here. He was a great Opa. I do miss him and wish I could have been closer to him and learned so much of his history. He had 19 siblings, which I have a photo of! I will post that someday soon. Hi Judith, thank you for your kind words, both you and Virginia put a big smile on my face! I have not been back to Germany since I was 13 years old, he was living at that time. It was good to see him and we spent time together. My Mom and I flew back for Christmas (Christmas in Germany is unbelievable) and stayed for 3 weeks, it was the best experience I have ever had. I was never able to see his gravesite and how I wish I could have! I have several photos like I posted above but I haven't figured out how to scan them "bigger". My Oma really took care of the gravesite, Germans take great pride in maintaining them. He does have a beautiful smile and it warms me each and everytime I look at that photo, thank you for seeing that, I am glad you read my post. This is a great tribute to your Opa. I am certain that he is more than proud of you. I have to agree with you, I would have a problem with the way Germany handles the 20-30 year "rental" of graves. It is all so different. It is good to hear that Oma will be near you and you will not have to go through this again.